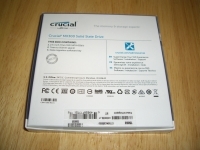 Crucial is a brand of Micron, one of the largest memory manufacturers in the world, and they have been in the business for over 35 years. Today we are looking at their MX300 750GB limited edition solid state drive, which builds on the previous performance of the MX series SSDs, and adds the latest 3D NAND which they claim will speed up boot times and allow you to fly through even the most demanding applications. 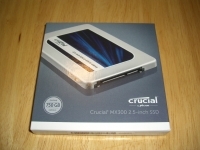 The Crucial MX300 750GB solid state drive comes in a small square box that measures approximately 5 1/8" x 5 1/8" x 5/8". The top of the box has a full color picture of the drive and it includes the model and capacity info. The back has a contents list. Cutting the seal allows you to lift the lid of the carton and reveal the drive inside. 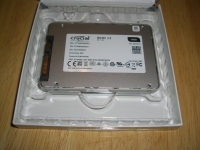 The drive has a label which lists the part number, model number, serial number, and speed. 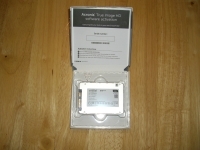 Also in the box is an Acronis True Image software key to make your transfer from your old drive to this drive easy. Also included with the drive is a small plastic spacer in case your bay is thicker than the drive.